The RavenDB Security Report called out the fact that we were using 2048 bits RSA keys when we were generating certificates. 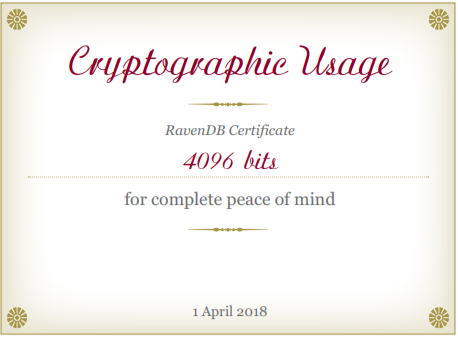 RavenDB generates certificates during automatic setup and when you want to generate client certificates directly from RavenDB. Now, 2048 bits RSA has no known attacks, it seems that there wouldn’t be any shock and awe at the cryptographic community if it would be broken at sometimes in the future. Because of that, the general recommendation is to use at least 3072 bits, but I don’t like that number, so RavenDB is now using 4096 bits RSA keys when it needs to generate a certificate. This significantly increases the certificate generation time (to the point where it is humanly observable! ), but that is a very rare operation, so we don’t really care.